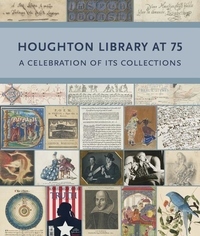 Houghton Library--the primary repository for Harvard University's rare books, manuscripts, and much more--celebrates its 75th anniversary in 2017. Houghton's holdings span nearly the entire history of the written word, from papyrus to the laptop. This anniversary volume presents a snapshot of the unique items that fill the library's shelves. From miniature books composed by a teenage Charlotte Brontë to a massive medieval manuscript hymnbook; from the plays of Shakespeare to costume designs for Star Trek; and from the discoveries of Copernicus to the laptops of twenty-first century writers, the selections celebrate great achievements in many and diverse fields of human endeavor. For the first time, readers will be able to tour the Houghton Library collection--which draws thousands of visitors from around the world each year--from home, with full-color illustrations.